So all the talk about the 143rd anniversary of the Chicago Fire seems to be about the fiasco over the weekend when a glorification of same--that was supposed to burn some wooden houses down in the middle of the Chicago River downtown--didn't exactly happen the way it was supposed to. Luckily, the nature of the failure was such that instead of igniting another wide-ranging conflagration in our fair city, the failure was a failure to ignite. Which disappointed many Chicagoans. This has left Ald. Ed Burke (14), of all people, demanding our money back from those paid hundreds of thousands of dollars to get the houses a-burning. But instead we citizens got houses that wouldn't burn. In defense, a lot of defenders are saying, "oh, so what? The throngs had a good time along the river and got to eat dinner out of food trucks." I was surprised to find that so many people in Chicago are pyromaniacs. Who knew that watching burning frame houses on the river would turn a whole city on like this? So our celebration of the Chicago Fire in Chicago has been dampened by quite the setback. To make up for that, here's a little story I'll share about the long-ago fire, a nice human story that I've always loved. 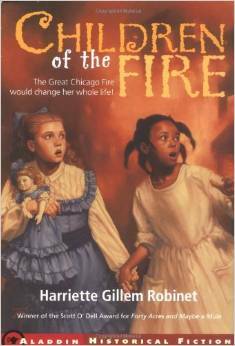 In 1871, according to the children's novel, "Children of the Fire," (based on a true story) a little African-American girl named Hallelujah lived in a house exactly where mine is now at Roosevelt and State. The fire went northeast as we all know--from the O'Leary home--and somehow, Hallelujah and her white and affluent friend Elizabeth ended up on the street that night following the path of the fire--seeing all that happens, trying to escape the flames, and in a way sort of having the time of their lives. But in a serious way. So tonight, as the memories of the fire burn bright in all our minds, I won't be thinking of our Saturday night failure to ignite. I'll be thinking of Hallelujah, who came before me, hitting the streets with Elizabeth, witnessing one of the great horrors of history. Which, as we all know, for Chicago's sake, gave us the chance to rebuild and become an architecture mecca.